James Dean, an actor whose name still echoes throughout the world sixty years after his much too short lived career, inspired generation after generation with his cool persona and rebellious lifestyle. His career, which spanned over only three films, was enough to secure his position as one Hollywood’s finest and most talented stars, often being compared to the likes of Marlon Brando. After dying too soon in a horrific car accident at the age of just 24. before his two biggest films were even released, Dean’s entire legacy has been shrouded in misfortune and mystery, with many people speculating that supernatural forces had a part to play in Dean’s demise. As bold and ridiculous the claims of the supernatural having anything to do with Dean’s death may be, there’s no denying the strange and bizarre nature behind the incidents surrounding his career. Dean himself was known for having an interest in the occult, taking an interest in witchcraft after being associated with self-proclaimed witch, Maila Nurmi, and he was also known for frequently talking about death; supposedly envisioning his own death and predicting he wouldn’t live past the age of thirty. As a result, Dean’s unfortunate death and mystery surrounding his car have been linked to a curse involving the occult. 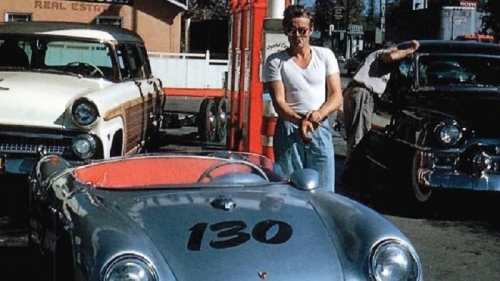 One of Hollywood’s oldest and well-known cases of curses involves James Dean’s car, a Porsche Spyder, purchased by Dean who bought it specifically for professional racing. The car met the disapproval of almost everyone close to Dean, each of whom claimed the car to be dangerous. One such a name was Alec Guinness who famously told Dean he would die within a week if he were to drive the car. This was one week before he died driving the car. Guinness recounted what he called a ‘spooky occurrence’ on an episode of Parkinson, claiming he felt an odd sensation when he was shown the car by Dean and felt as if a ‘different voice’ came out with the warning to Dean. As if that wasn’t spooky enough, two other strange coincidences occurred before Dean’s accident, the first of which was Dean Acquiring a speeding ticket just two hours before the incident (it should be noted that Dean wasn’t actually speeding during his accident) and the second was an interview about his car, prior to the accident. The interview, which was a highway safety promotional video, had Dean talking about driving on the highways. In summary, he advised people, particularly younger audiences, to drive safely on the highways, ending with: “The life you might save, might be mine”. His accident occurred two weeks after the interview. It seems as if Dean’s accident was inevitable due to the number of warnings, but; who wouldn’t advise someone to drive carefully after purchasing a fast sports car? Dean’s death would be the result of his car swerving out of control and launching into the air after trying to avoid an oncoming car attempting a left turn. As a result of the accident, Dean was killed on impact, whilst his passenger and mechanic, Rudolf Wütherich, was launched from the car and sustained major injuries. While Wütherich would survive the accident, he would himself die in a separate car accident later in 1981. The car was written off, with only three parts of the car salvaged. The three remaining parts, along with the rest of the wrecked car, was purchased by the man who had originally modified the car for Dean, George Barris. Barris then sold the three salvaged parts to avid racer, Dr William Eschrid, who took one of the salvaged pieces, the engine, and put it in his car. He, in turn, sold the remaining two parts to his fellow racer Troy McHenry, who also added the parts to his own car. Both Eschrid and McHenry then had accidents in the same race. McHenry crashed into a tree and died on impact, whilst Eschrid suffered major injuries after his car locked up and rolled over whilst taking a turn. Barris, on the other hand, took the wrecked body of the car and took it on tour for The National Safety Council, showing the car to High School students in attempt to alert them to the dangers of speeding. During the tour, whilst the car was being loaded onto a trailer, it slipped off and broke an attendants legs. The strange occurrences didn’t stop there as whilst the car was being stored in a warehouse in preparation for a show the following day, the warehouse caught fire and burned down. Soon after, whilst the car was being transported to Salinas, California (the location Dean was intending to reach when he had his accident), the flatbed carrying it skidded on the road, flinging the driver out of the truck and causing the car to slide off the flatbed; crushing the fallen driver to death. There are further unconfirmed incidents, including botched robberies and a child being crushed by the car after it collapsed off its display stand, but the only confirmed incident after the flatbed disaster was the car’s disappearance. After being shipped to Florida on a truck in preparation for another tour, Barris was horrified to receive the truck in Florida without the car inside. The car has been missing ever since, with no clue of its whereabouts, or who could have taken it. The curse does, however, remain one of Hollywood’s biggest mysteries. This is not the only series of unfortunate events that James Dean is linked to, as he is also one of four of his fellow cast members from Rebel Without a Cause to die under suspicious circumstances. Dean, who plays Jim Stark in the film, would never see its release, dying just a month before it debuted in cinemas. In 1974 (19 years later), Edward Platt, who played Stark’s police councilor, committed suicide after battling undiagnosed depression and financial difficulty. Sal Mineo, who played Plato, Stark’s best friend, would die 21 years after Dean, in 1976, after being stabbed to death by a stranger. Finally, the beloved actress who played the love interest of Jim Stark, Natalie Wood, drowned in 1981 in the midst of her acting comeback, after she fell off her yacht and into the ocean. All four deaths are unusual and certainly ‘un-natural’ causes of death, and all happened within a few years of each other, with the exception of Dean of course. These untimely deaths have led some to speculate the work of another curse, perhaps linked to James Dean. While it’s unusual for four actors from the same film to all die too young from tragic deaths, it’s a stretch to put the blame on a curse. After all, there were still other cast members who went to live long and fulfilling lives. Dennis Hopper, for example. Whether you believe in curses is ultimately down to your own personal beliefs, but there’s no denying the strange circumstances surrounding Dean’s car and, indeed, the actor himself. Personally, I’m not believer in the supernatural and have always been a skeptic at heart, but if there was ever anything to convince me that there’s such a thing as a curse, it would be the unusual case of this Rebel Without A Cause star and the tragedies surrounding himself and his vehicle..
25 year old Film and Media graduate with a passion for films, even bad ones. Animal lover, gym goer and rum connoisseur.